Rumour has it that a passage is possible on the eastern side. This makes sense as there is a foot trail called Wombat Parade that goes along the base of the escarpments on that side. Hence if bushwalkers are going to climb Mt Warrigal, it is likely to be somewhere along the Wombat Parade, not the way found by Saf and I. But there is a dearth of information on the Web on this mountain. It seems that people who know the ascent point are keeping it a secret ! Then I met Michael Keats. 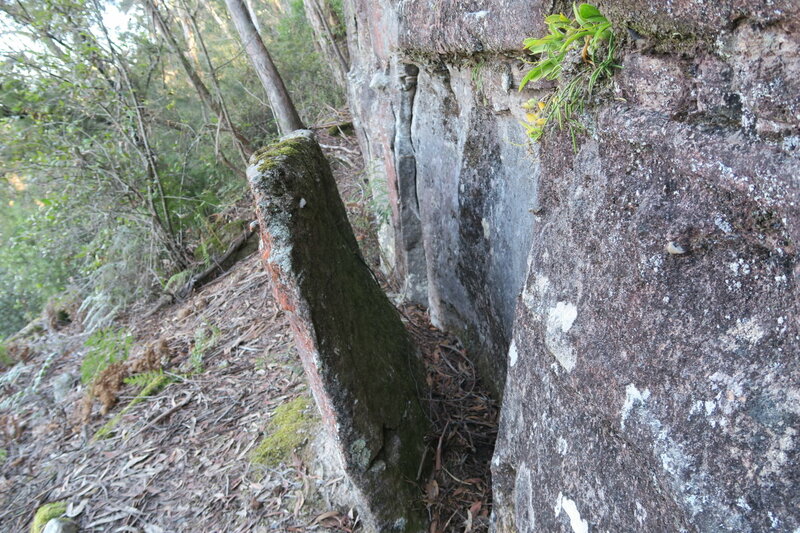 He had climbed up to the summit of Mt Warrigal a few years earlier. And he kindly gave me the coordinates of the ascent point (at the boundary of GR 430 522 and GR 430 523). Thank you Michael ! And my suspicion was correct, the way up is on the eastern side, along Wombat Parade. And so today, NC and I are going to find this ascent point ! And since we are there, we will also circumnavigate the entire mountain along the base of its escarpments. 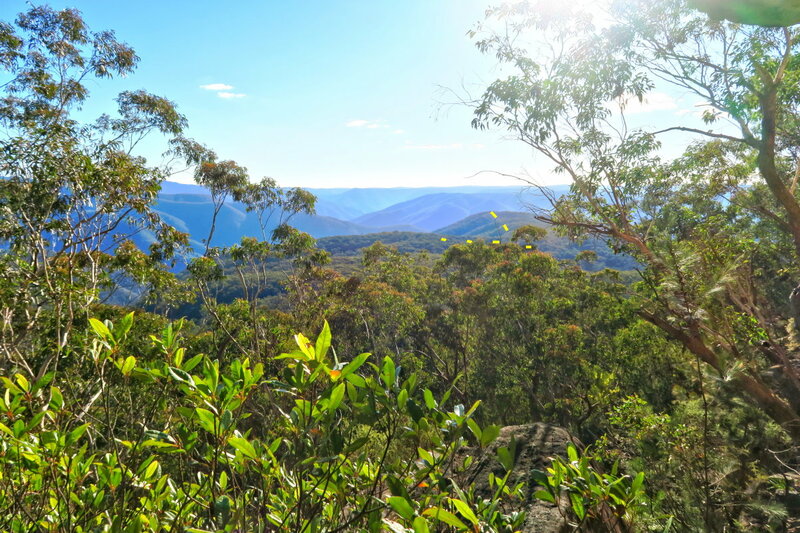 At 970 meters, Mt Warrigal is the highest of all the Wild Dog Mountains. The usual way to approach the Wild Dog Mountains is to start at Dunphys Camping Area. From there to Mt Warrigal, the routes are limitless ... up to you to mix and match. Today, NC and I go via Lyrebird Point and Faithful Hound Ridge. Return is by way of Medlow Gap Northwest Firetrail. The area at the top of Mt Warrigal is triangle shaped ... see the maps below. The summit itself has too many trees, and so the view from there is limited. But if you walk to the southern tip, 600 meters from the summit, there is a fantastic rock platform with a marvellous 270-degree panorama centred towards the south. Had I known about it, I definitely would have visited this southern tip in my previous trips to Mt Warrigal. Why is this wonderful lookout platform not mentioned anywhere on the Web !?! Well, this blog should fix up this glaring omission. Below is our route, red colour, superimposed on the 1:25,000 scale map. - Start at Dunphys Camping Area. 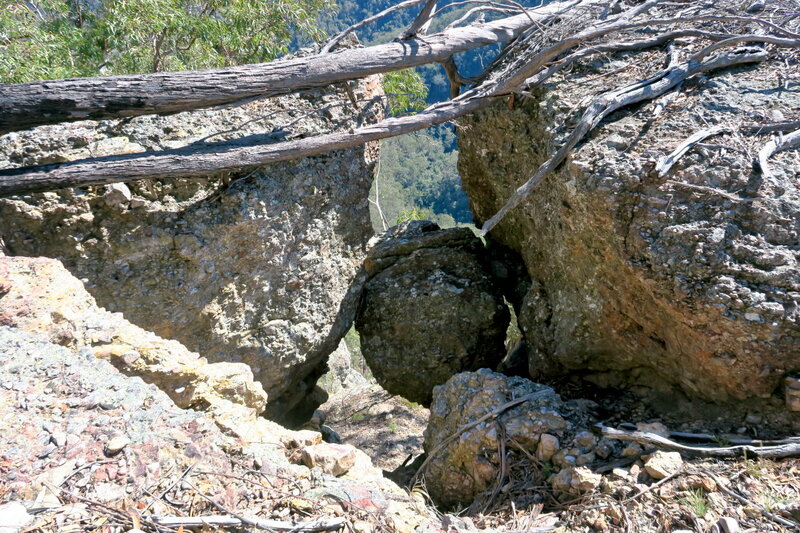 - Go east on Bellbird Ridge Firetrail. 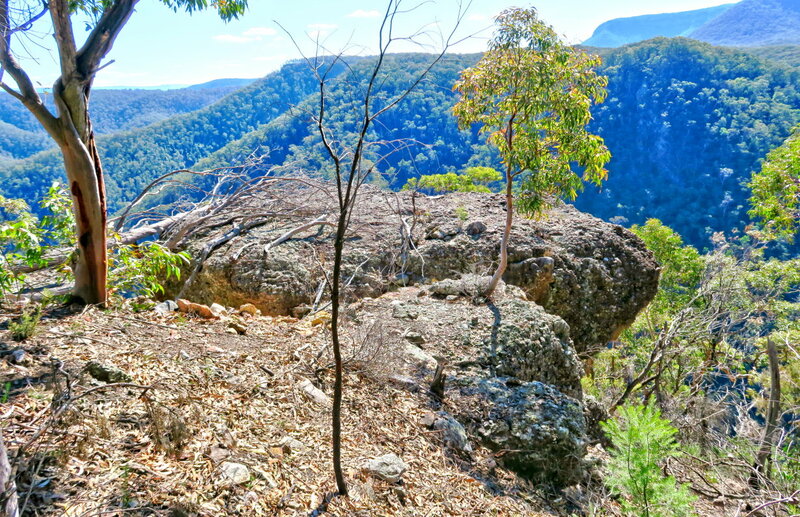 - Then Medlow Gap Northwest Firetrail. 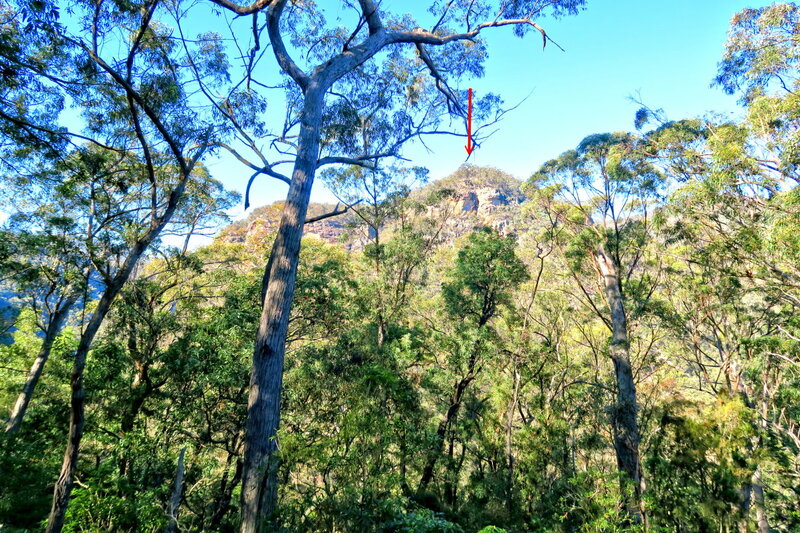 - Then go off track, along Lyrebird Ridge to Lyrebird Point. - From Lyrebird Point, climb down to Breakfast Creek. - Climb up Faithful Hound Ridge to meet up with a foot trail. - Follow foot trail to Blackhorse Gap. - Then to eastern tip of Mt Warrigal. 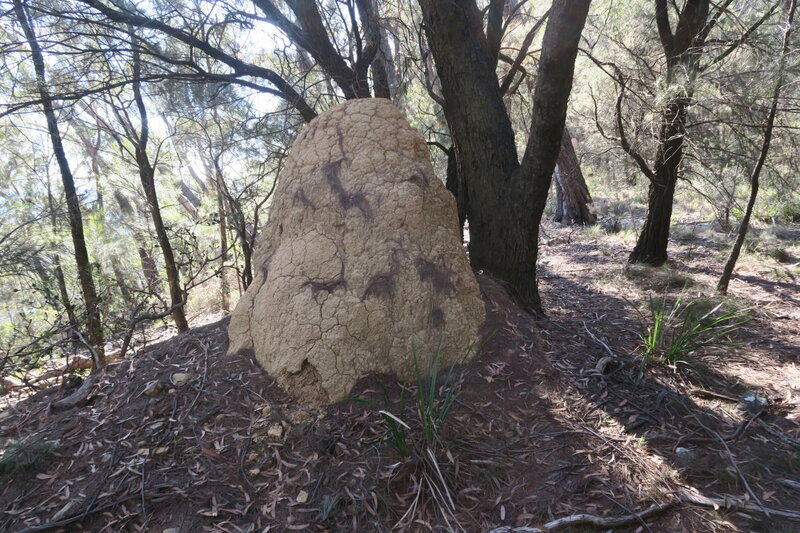 - Walk along Wombat Parade, ie along the base of Mt Warrigal's east side escarpment. - Climb up the cliff at the boundary of GR 430 522 and GR 430 523. - To the southern tip of the top of Mt Warrigal. - U-turn. To Mt Warrigal summit. 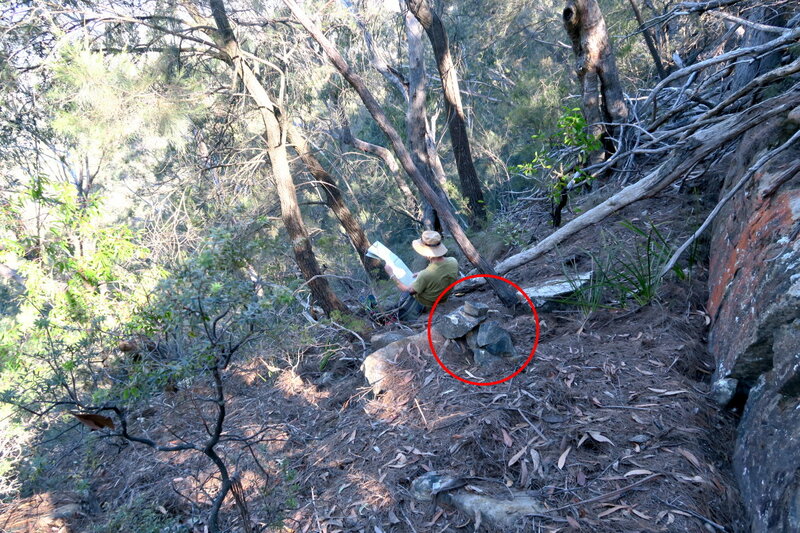 - Re-trace steps; back down the east side escarpment and back to Wombat Parade. 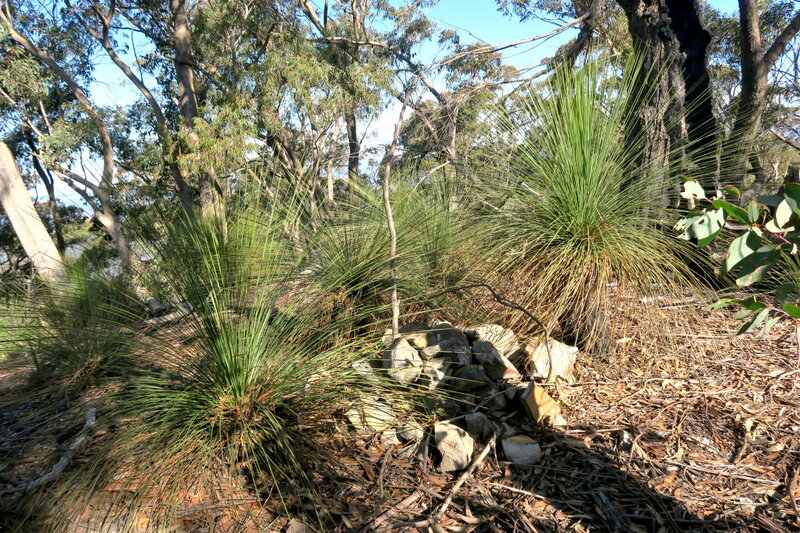 - Circumnavigate, clockwise direction, around the base of Mt Warrigal's escarpments. 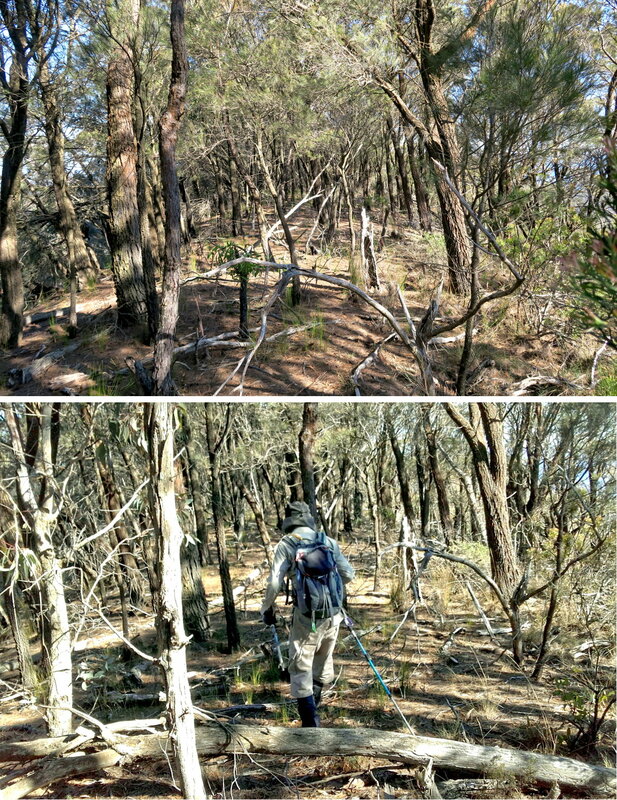 - When we reach the eastern tip of Mt Warrigal, re-trace steps back to Blackhorse Gap. 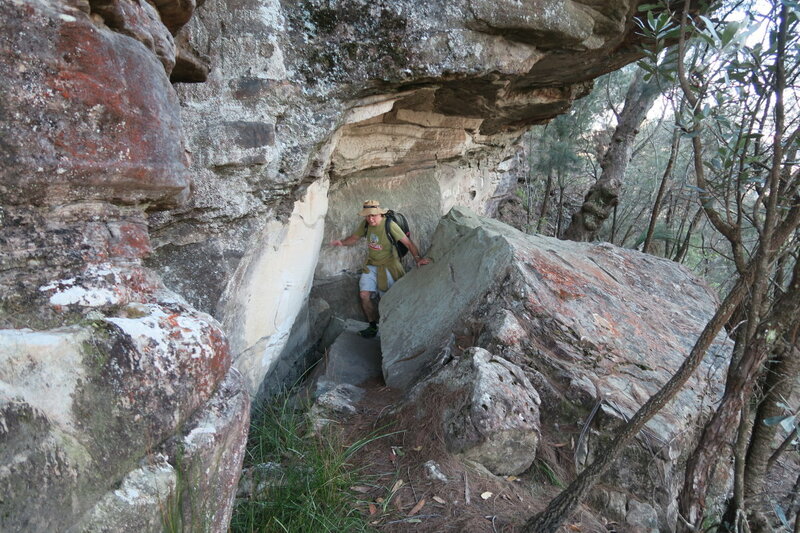 - Follow foot trail all the way to meet up with Medlow Gap Northwest Firetrail. - Back to Dunphys Camping Area via the firetrail. 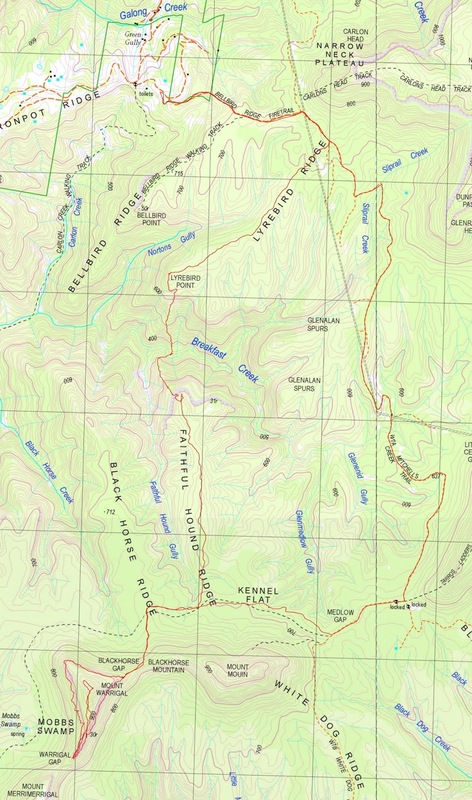 13:44 9.1 km At Mt Warrigal eastern ascent point, boundary of GR 430 522 and GR 430 523. Spend some time along the way looking at the conjunction of Mercury, Venus and Jupiter close to the horizon. 1) We start at Dunphys Camping Area. Here is NC crossing the stile from the camping area into Bellbird Ridge Firetrail. 2) Looking back at Dunphys Camping Area, bathing in the morning sun. 3) 20 minutes, 1.4 km after we started walking, we are at the junction of Bellbird Ridge Firetrail and Medlow Gap Northwest Firetrail. 4) 4 minutes, 340 meters from the junction in the previous pic, we are at the turn off to Lyrebird Ridge. The turn off is marked by the sign: "131-2"; and an access trail which goes along the top of the Ridge. 5) The track you see in the previous photo only lasts for 200 meters. It ends here at the powerlines. The powerlines run roughly from north-west-ish to south-east-ish. Our route cuts perpendicular across it, from north-east to south-west. 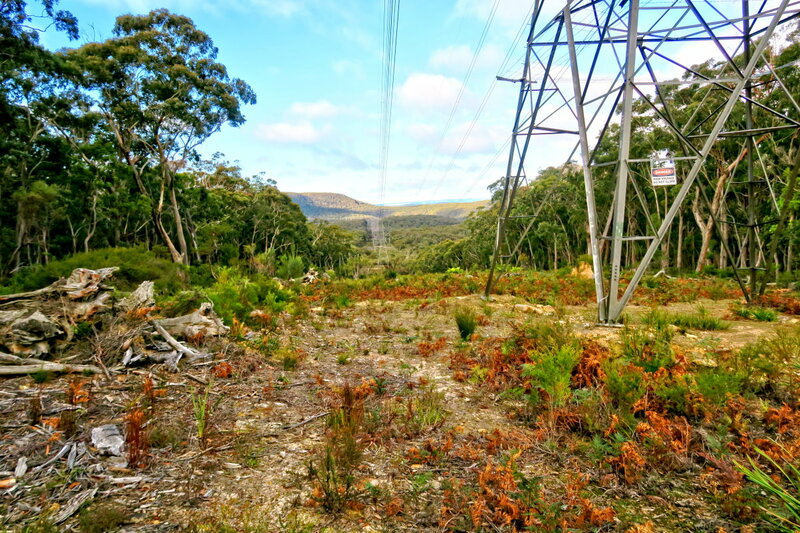 6) After crossing the powerlines of the previous pic, it is off-track walking along Lyrebird Ridge. I've been to Bellbird Point. 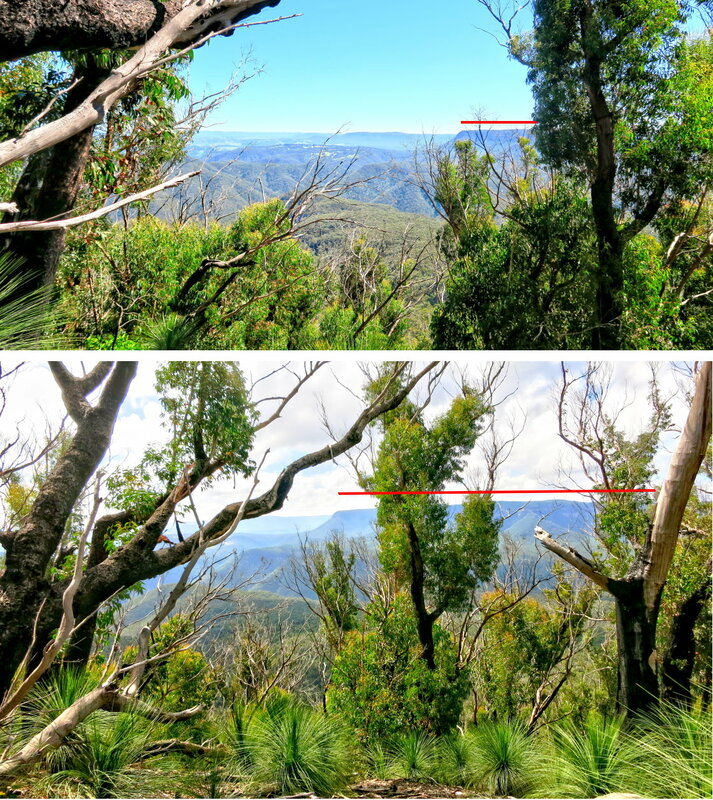 It has less trees and hence has better views than here at Lyrebird Point. But still, the panoramic views in this and the next 3 pics are quite good. 8) Zooming onto Mt Warrigal ... this is the north face of Mt Warrigal. - Red dots: There is a band of cliffs surrounding the entire mountain. 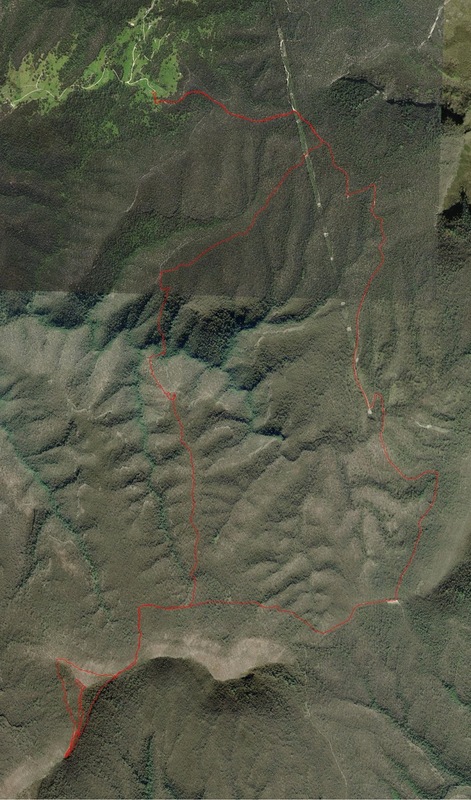 In the late afternoon, we'll walk along the red dots (base of escarpment) from right to left, towards Blackhorse Gap. - Towards west-ish: Running up the main valley near the centre of the pic is Breakfast Creek. - The red bar near the right edge: Together with the 3 red arrows on the right, form the Ironpot Ridge. - Towards north-west is Bellbird Point, the red arrow. - Dunphys Camping Area, where we started our walk, is behind Bellbird Point and can't be seen from here. These look like Zieria. Please correct me if I'm wrong. They are in full bloom ... beautiful. - Ziera: Each flower has 4 sepals and 4 petals. From Lyrebird Point, we go down towards Breakfast Creek. 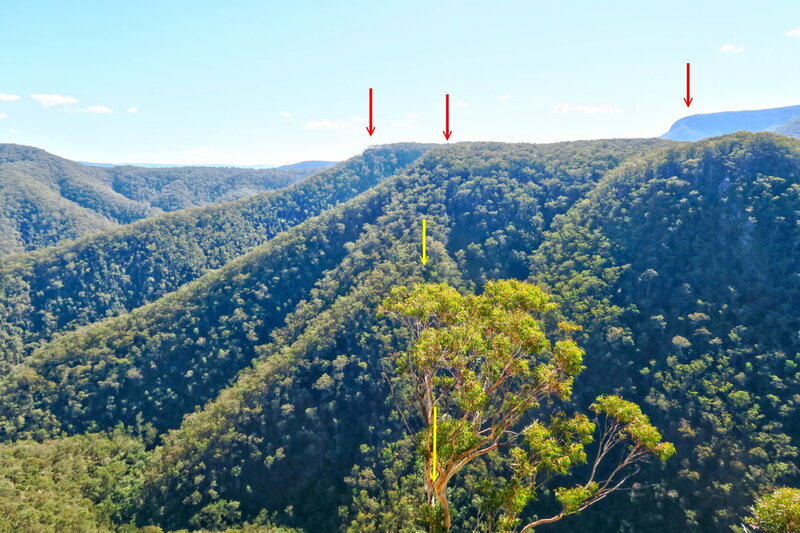 12) About halfway down from Lyrebird Point, we can see the top of Faithful Hound Ridge (red arrow) and its cliffs. 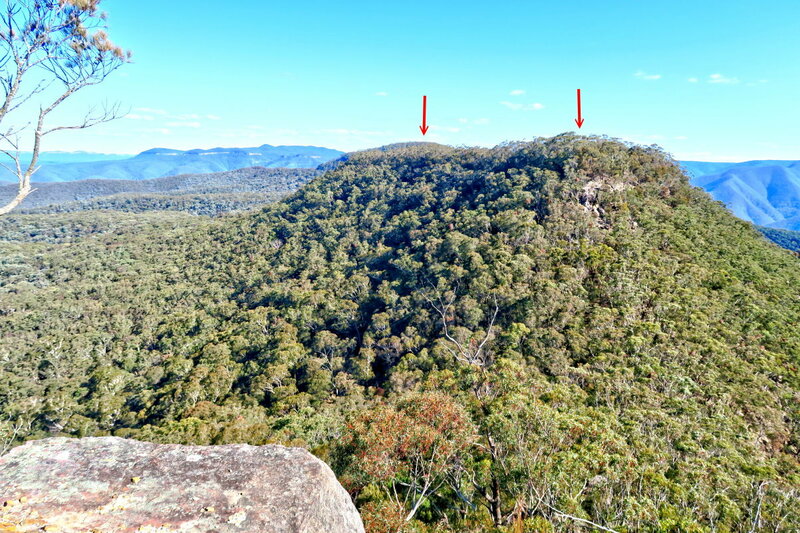 On our way to climb Mt Warrigal, we'll go via Faithful Hound Ridge and will reach where the red arrow is pointing at. 13) Around the same spot as where the previous pic was taken, we can see a large cave (red circle) on the flank of Black Horse Ridge. Has any one been to the cave? Can one scramble up to it without climbing gears? Please let me know ! And if you are interested to visit this cave, contact me and we can go there to explore. - Upper marker: Where photo #13 was taken. 16) We are close to Breakfast Creek now. In fact you can see the creek as a dark band across the pic. The terrain here is stonier than further back up the ridge where we came from. 21) Now comes this cliff that we need to scale over ... not right here ... see photo #22. The yellow arrow points to a ramp up the cliff. 24) This is the ramp up the cliff. NC was half way up when I snapped the previous pic. 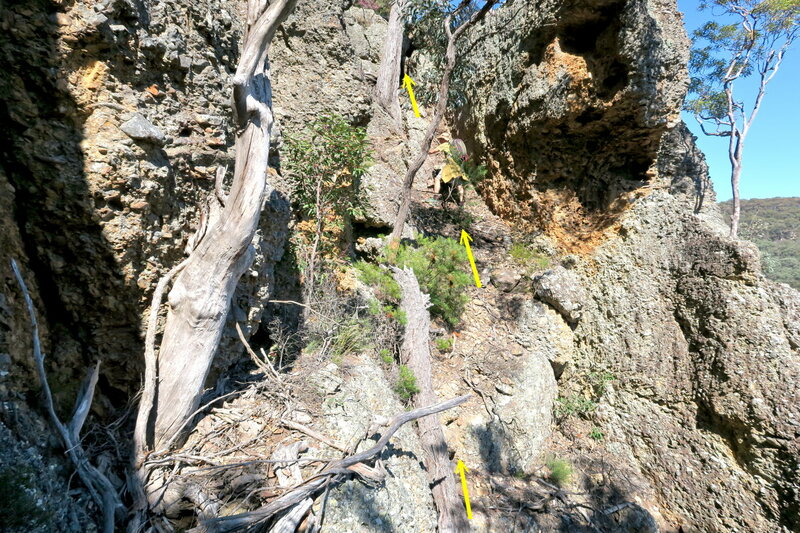 25) Immediately after climbing up the ramp of the previous pic, comes this vertical scramble ... the yellow arrows. This part of the climb can be scary if you are afraid of height and exposure. 26) After climbing up to the top of the cliff of the previous pic, turn towards the east a bit and you'll come to this lookout platform on a rocky outcrop. 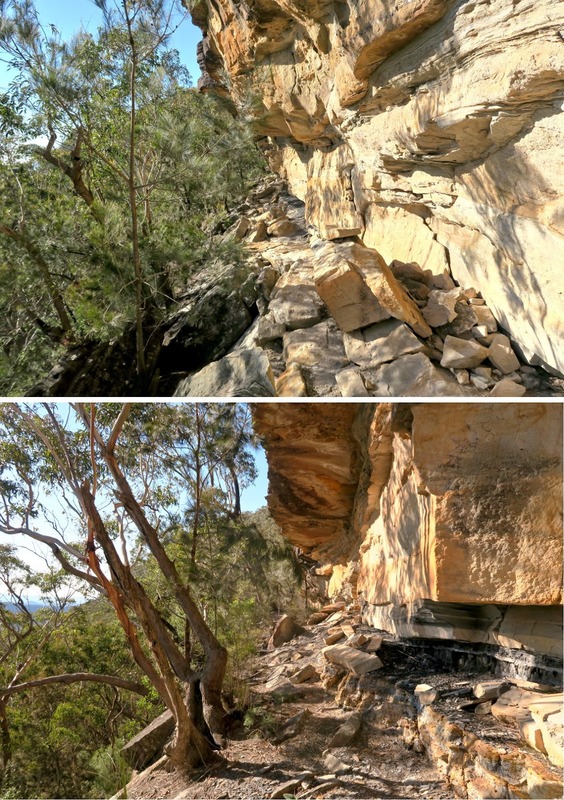 - The 2 downward pointing yellow arrows: The way we climbed down Lyrebird Point. 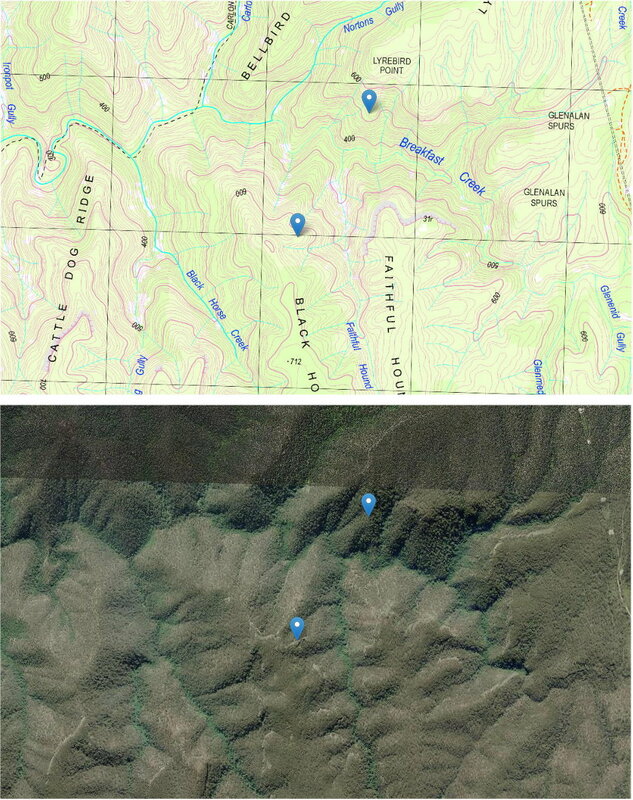 - The 2 horizontal yellow arrows: Medlow Gap Northwest Firetrail, along which we'll return to the car in the afternoon. - The gully immediately to the right of Bellbird Ridge is Nortons Gully. 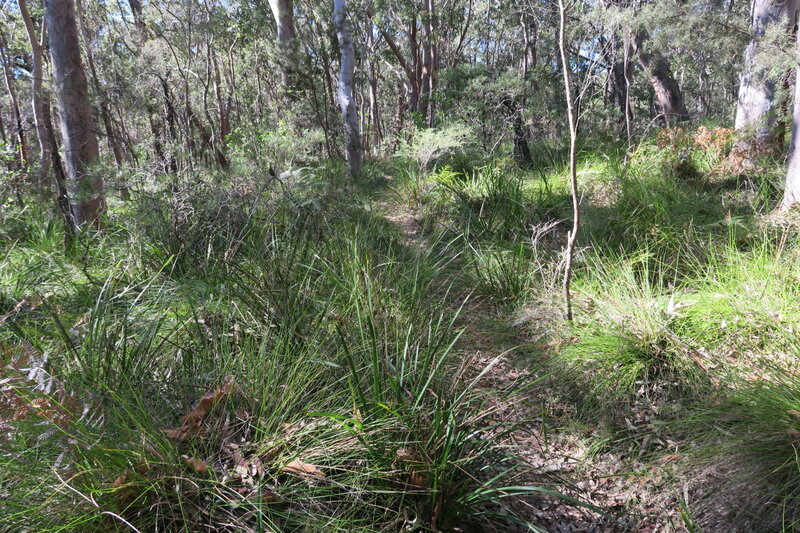 - Carlon Creek and Carlon Creek Walking Track is in the gully immediately behind Bellbird Ridge. - Dunphys Camping Area, where NC's car is parked, is between and behind Bellbird Point & Lyrebird Point, and can't be seen from here. 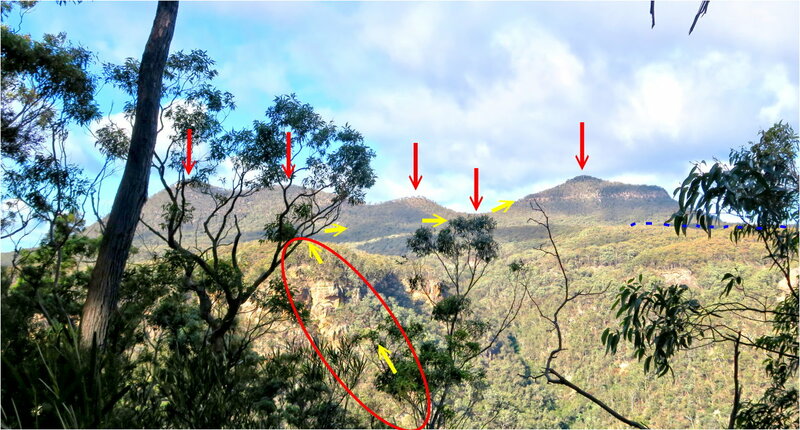 29) Zooming onto Bellbird & Lyrebird Points, the 2 red arrows in the middle of the pic. - Lyrebird Point is directly north of the lookout, ie where this pic is taken. 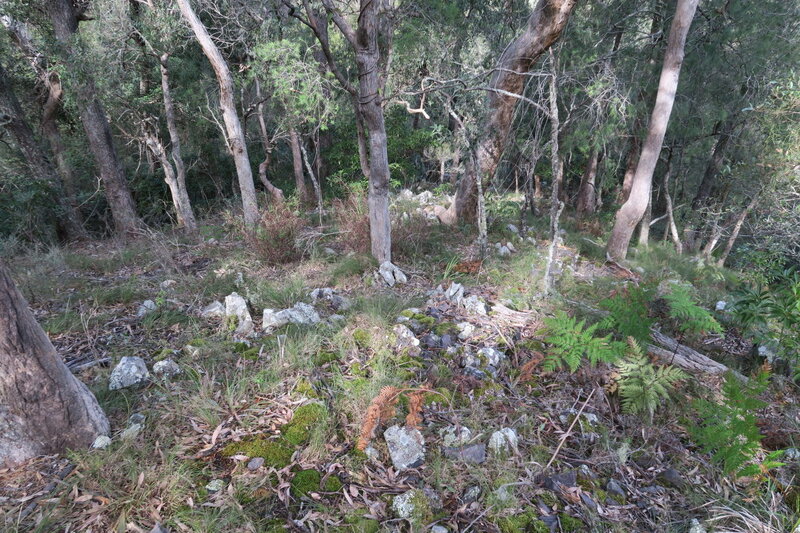 - Dunphys Camping Area is between and behind Bellbird & Lyrebird Points and can't be seen from here. 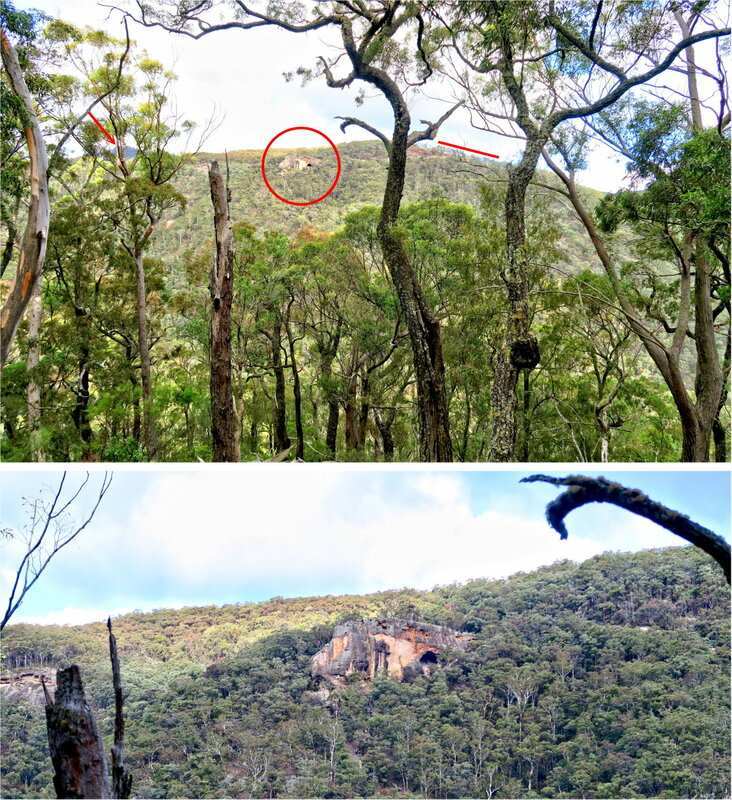 - The red arrow on the right points to Black Billy Head of Narrow Neck Plateau. 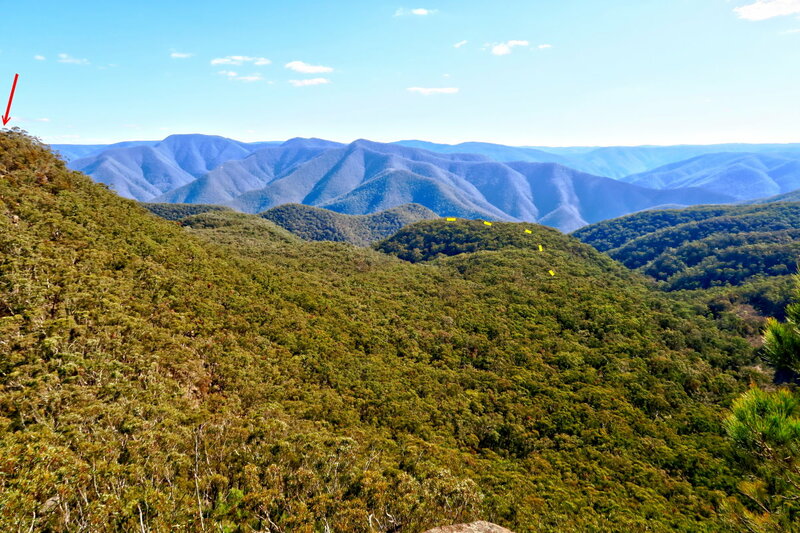 - Bellbird Ridge is the ridge slanting down towards left from Bellbird Point. It divides Carlon Creek on its left and Nortons Gully on its right. 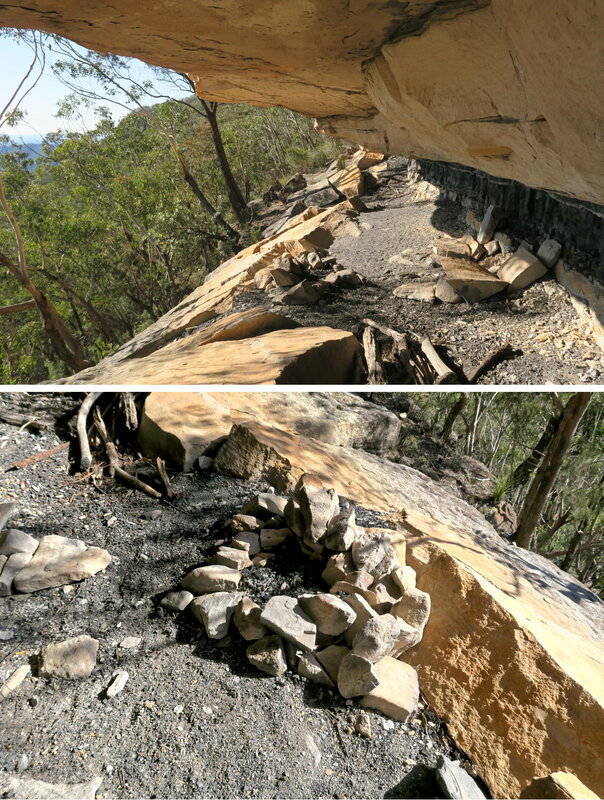 - Yellow arrows: The way we climbed down Lyrebird Point. After the lookout of the previous few pics, Faithful Hound Ridge becomes less steep. 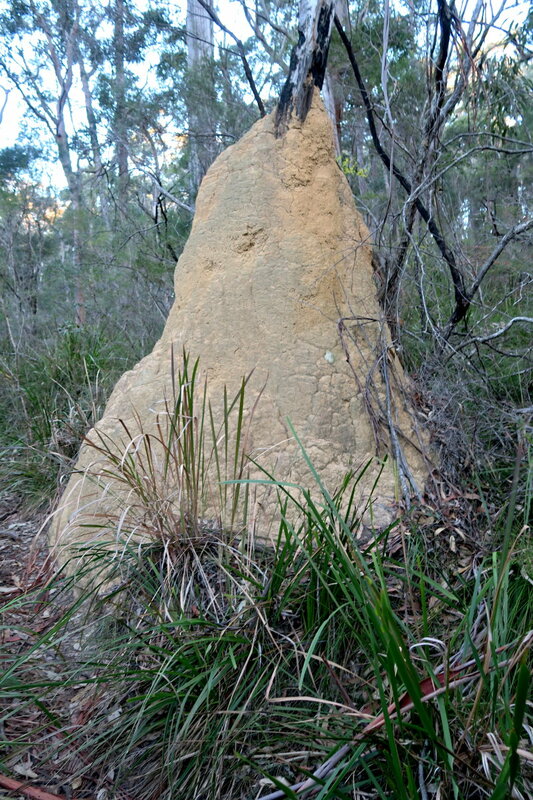 30) You are bound to see termite mounds in the Blue Mountains, no exception this time. This one is quite large, as tall as me. 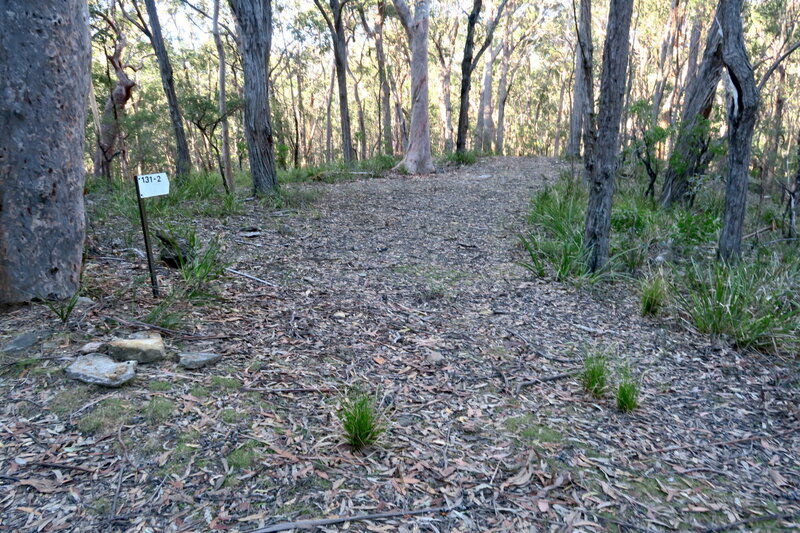 31) The end of Faithful Hound Ridge meets up with this foot track which heads towards Mt Warrigal. The other direction of the foot track goes towards east, to meet up with Medlow Gap Northwest Firetrail. 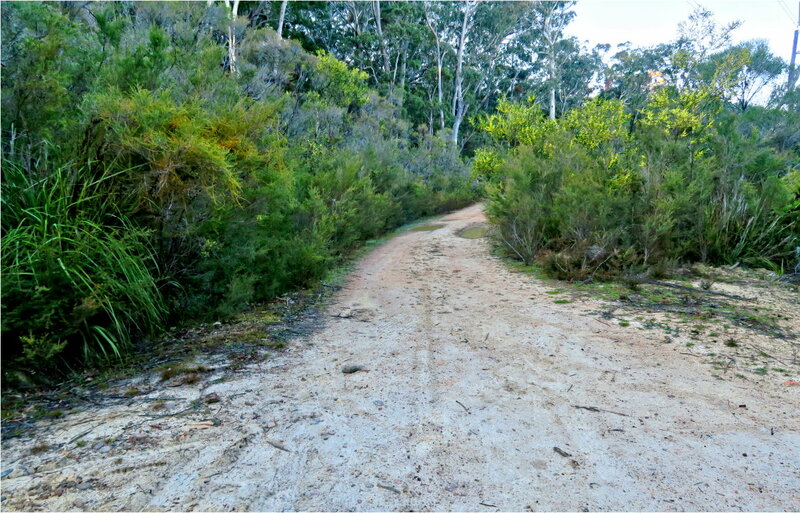 After we finish climbing Mt Warrigal, we'll walk along here to the firetrail; and from there to the carpark at Dunphys Camping Area. 32) This is it, Mt Warrigal ... specifically, the eastern tip of Mt Warrigal. To reach the top, we have to find a way to climb up the escarpment ! 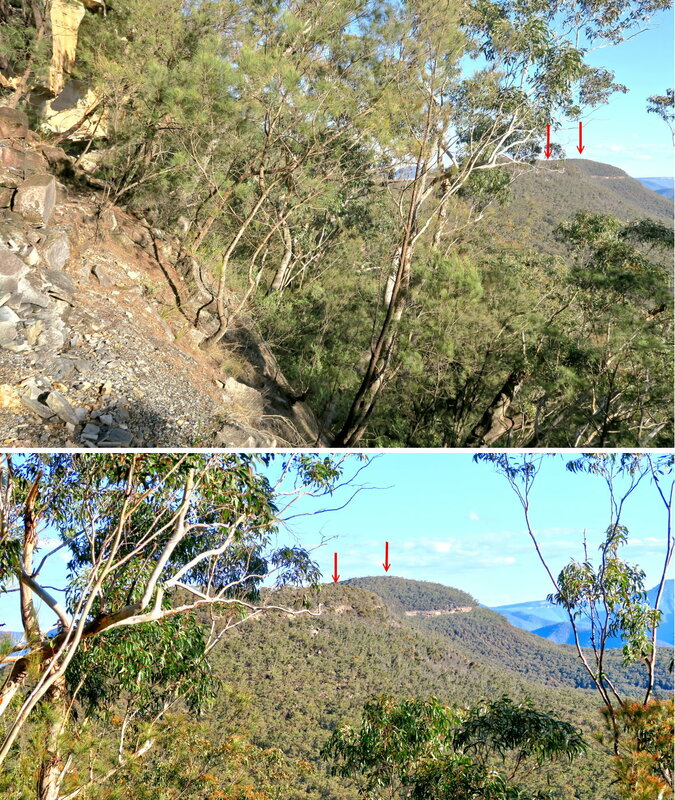 We now try to see whether we can climb to the top of Mt Warrigal from here at the eastern tip even though Michael Keats' instruction is to go further forward along the east side of the escarpment. 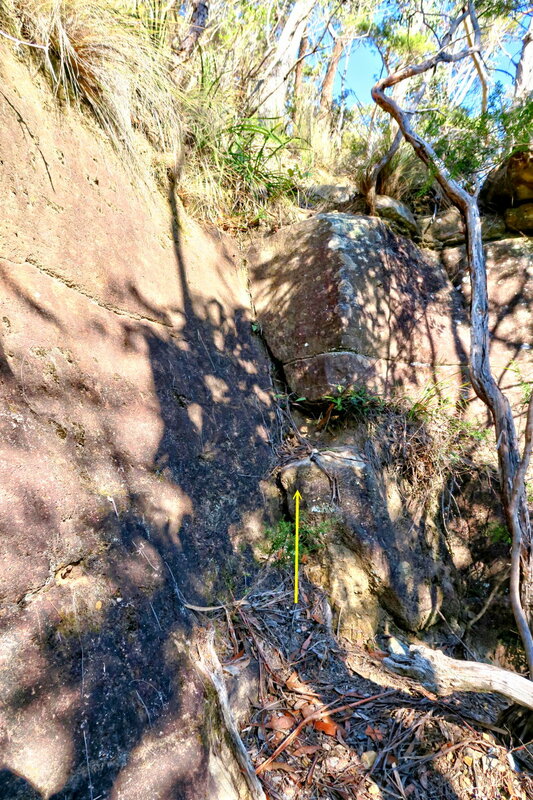 34) At the eastern tip of Mt Warrigal (photo #32 ), we go towards the left a bit, then climb up a bit; and are presented with this minor rock cliff. It is not so easy to scramble over it, but we manage to climb up. 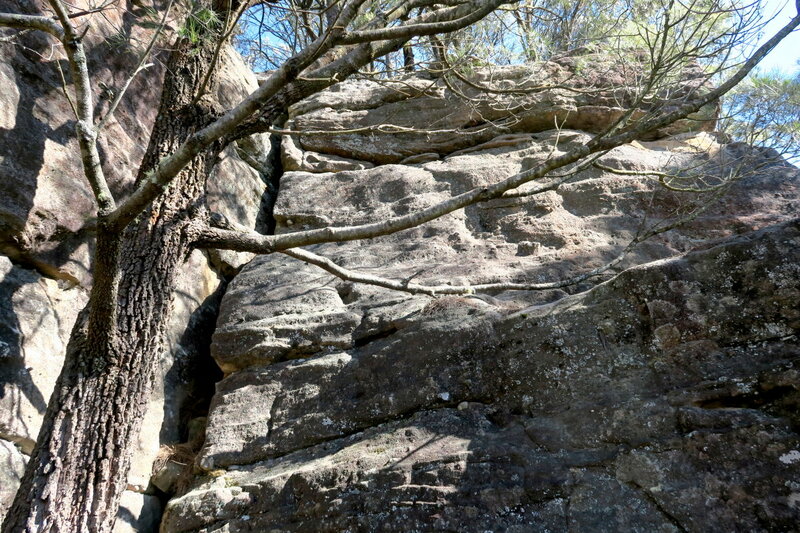 35) After climbing up (previous pic), we are met by this rock face. It looks climbable. Both Saf in 2015-04 and NC today made a half-hearted attempt to climb it. It is more difficult than it looks. An agile person probably can climb up here without a backpack. But the question is, will we encounter an unclimbable cliff further up? Anyway, we know from Michael Keats' instruction that we can climb Mt Warrigal from further south. So we soon give up, and retrace our steps back down to the base of the escarpment. - The footpad seen here, called Wombat Parade, will go through Mt Merrimerrigal, Mt dingo and all the way to Splendour Rock. - Notice there is a coal seam along the base of the cliffs. 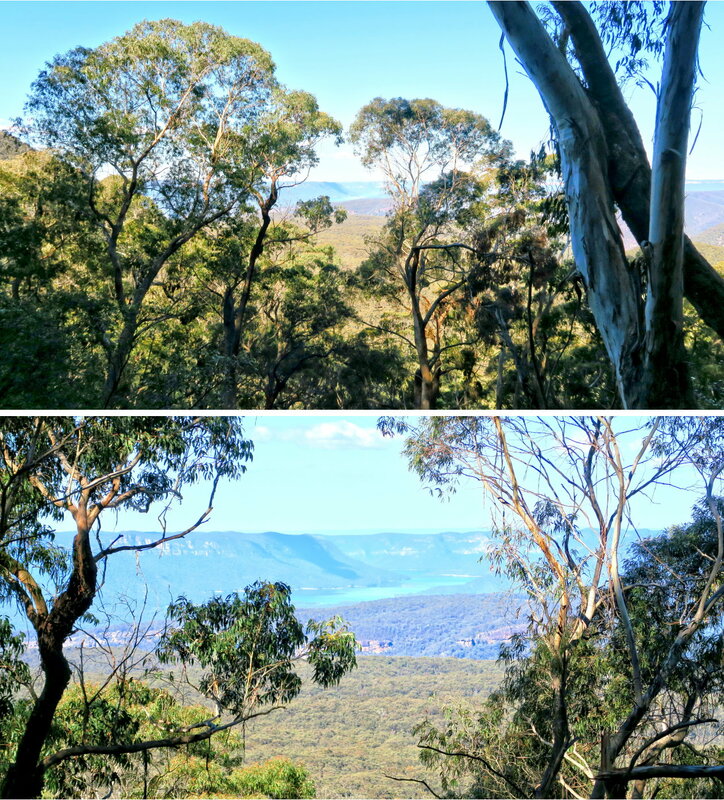 Through the trees, we get a glimpse of Lake Burragorang to the south-east. 39) This is it, Mt Warrigal eastern side ascent point at the boundary of GR 430 522 and GR 430 523. You can see the ramp off Wombat Parade to climb up the cliffs. - The big tree root: Need to climb over it. 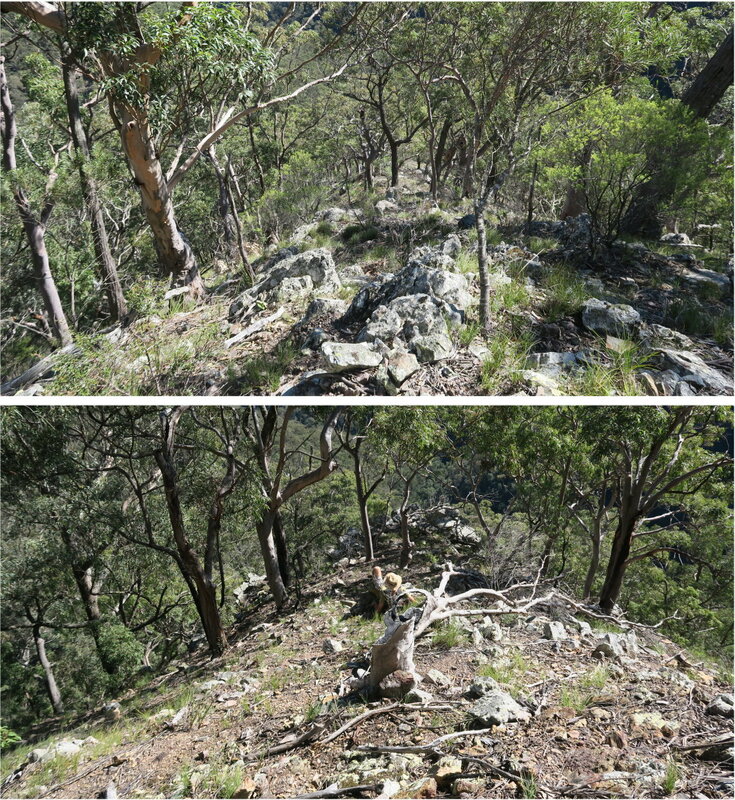 When RZ and I climbed Mt Warrigal 6 months ago in 2016-02, we tried to look for a way up along the east side too. But we missed this ascent point. 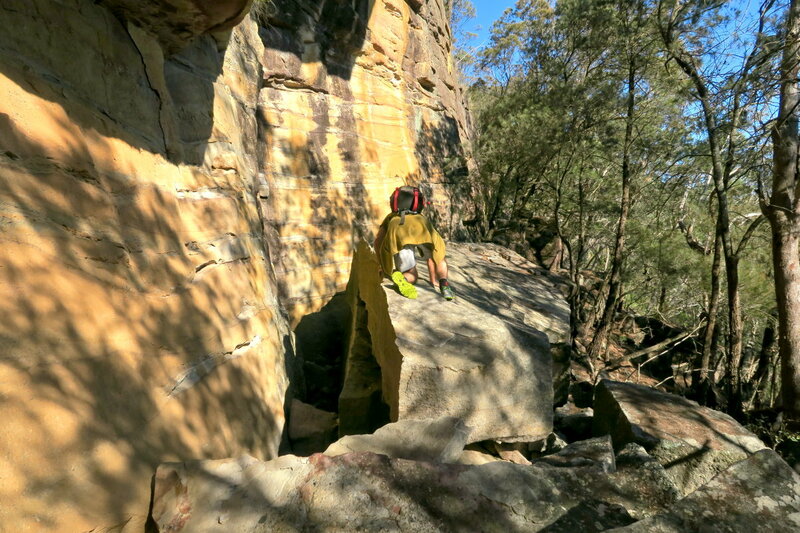 Well, our main objective was to climb all the 5 Wild Dog Mountains; hence we didn't have time to inspect closely every nook and cranny of the cliffs along Wombat Parade. And without a coordinate, it was like looking for a needle in a haystack. This time, armed with the coordinates given by Michael Keats, it is quite easy to locate this ascent point. The only minor obstacle is the rock in the middle of the ramp, don't worry, it is not too hard to climb over it. This rock is the one in the red circle in the previous pic. 41) We've just climbed up the cliffs via the ramp. - NC is checking the map and GPS to get a fix on our location. - There is a cairn, the red circle. As there is no cairn on the Wombat Parade trail to mark the ascent point, I can only assume that people who know the way up prefer to keep this passage a secret. 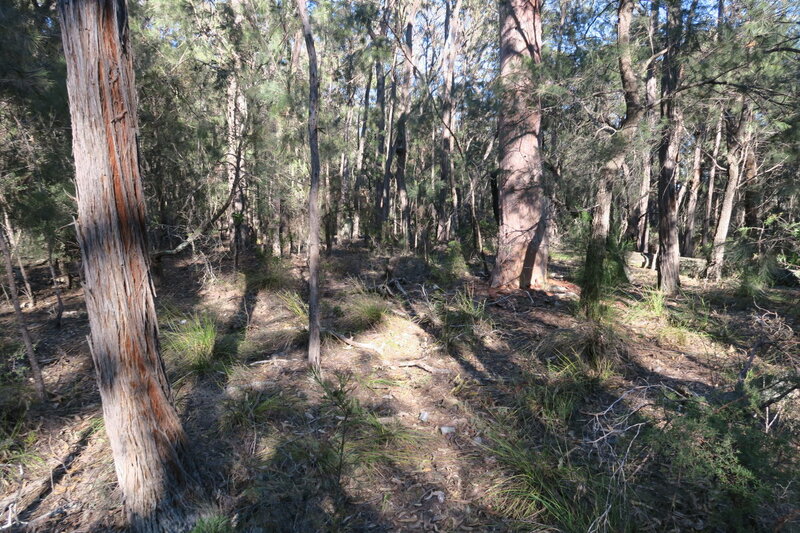 - It is an open casuarina forest. The floor is carpeted with droppings of their needle-like leaves. - I'm the guy in the lower pic (photograph courtesy of NC). 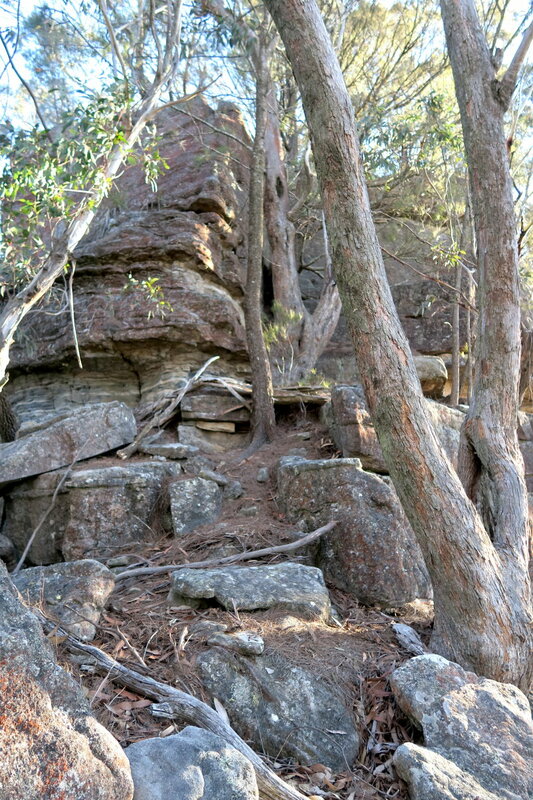 43) The southern tip of Mt Warrigal is rock platform jutting out saliently from the tip. It has a fantastic panoramic view from east to south to west. It is strange that this wonderful lookout is not mentioned anywhere on the Web ! 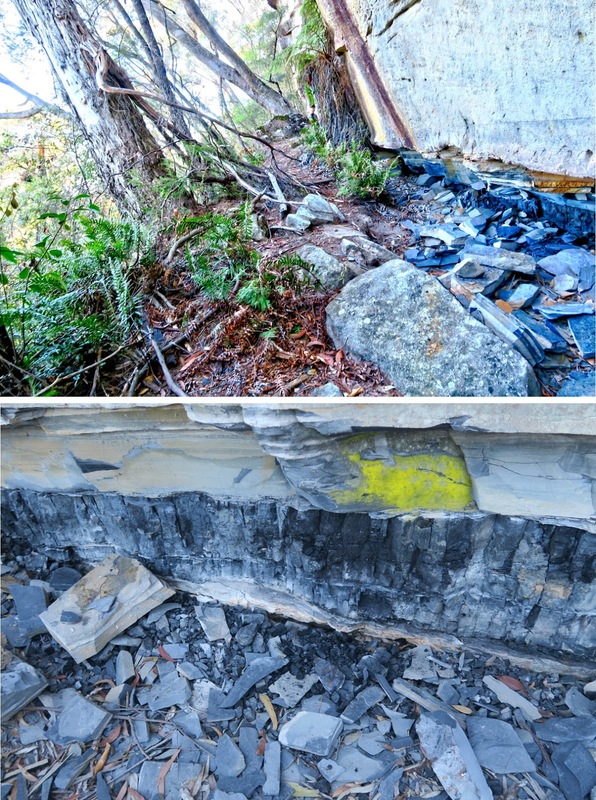 - Upper pic: NC is sitting of the edge of the rock platform. - Merrigal Creek flows in the valley between Brindle Dog Ridge and Blue Dog Ridge. - This pic is also the continuation to the right of photo #44; and is towards south-west-ish. 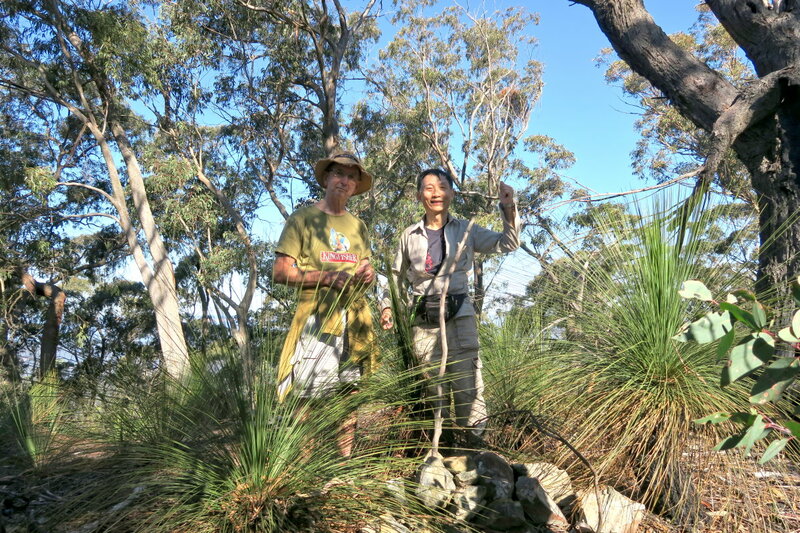 After enjoying the view from the southern tip, we head north to the summit of Mt Warrigal - 600 meters away. 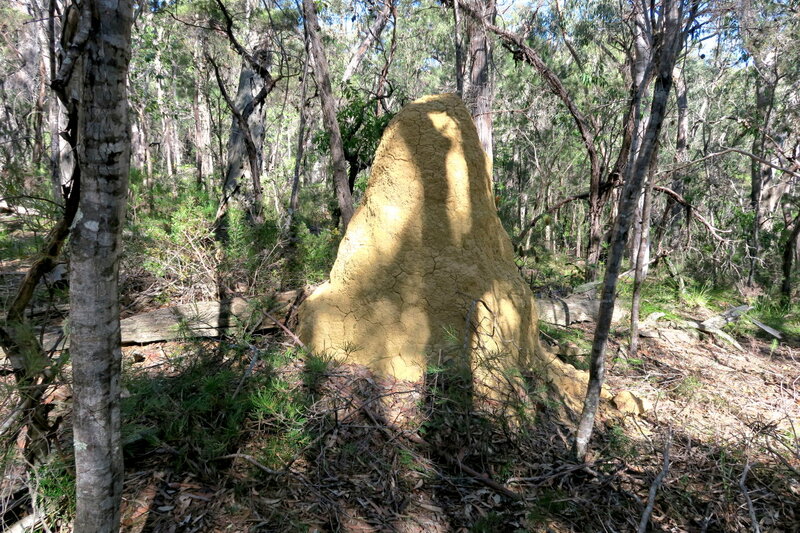 47) Passing this termite mound with casuarina needle leaves dropped on it, and also piled up around its base. 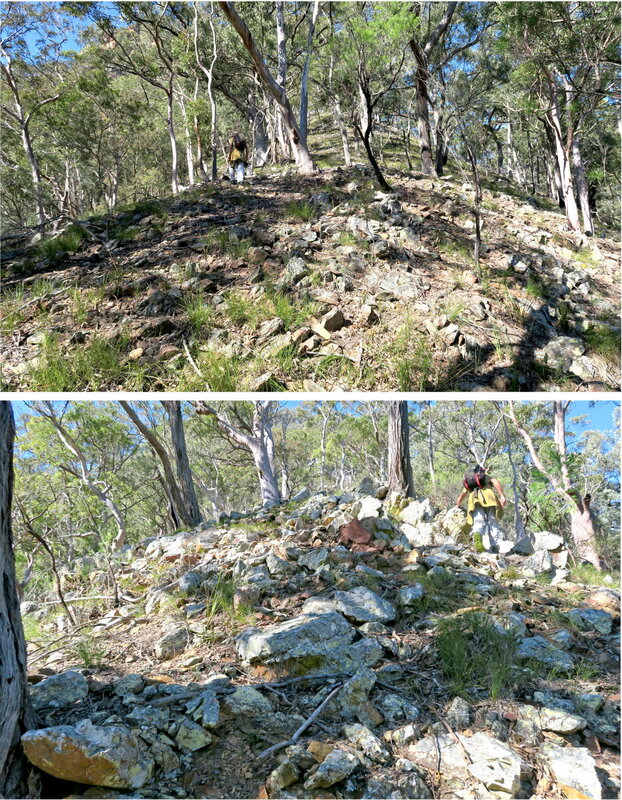 48) The southern part of the top of Mt Warrigal is quite level, and mostly like in photo #42. The northern part is steeper and more scrubby. This pic is around the middle where there are a few relatively open rocky areas. 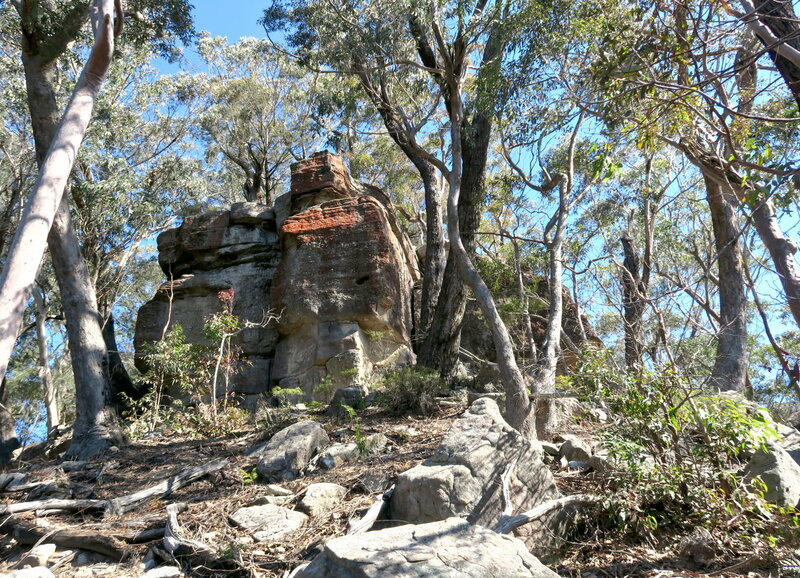 49) Mt Warrigal summit is just in front. 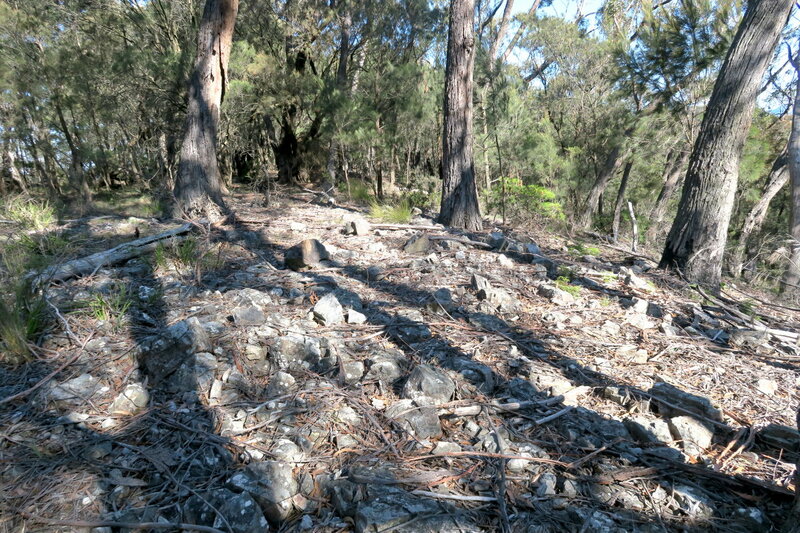 50) This is it, the summit of Mt Warrigal. The cairn is just a pile of loose stones with a stick poking up from it. 52) Unlike the southern tip, there are too many trees at the summit. Here are the partial views towards north. The red horizontal bars indicate where Narrow Neck Plateau is. 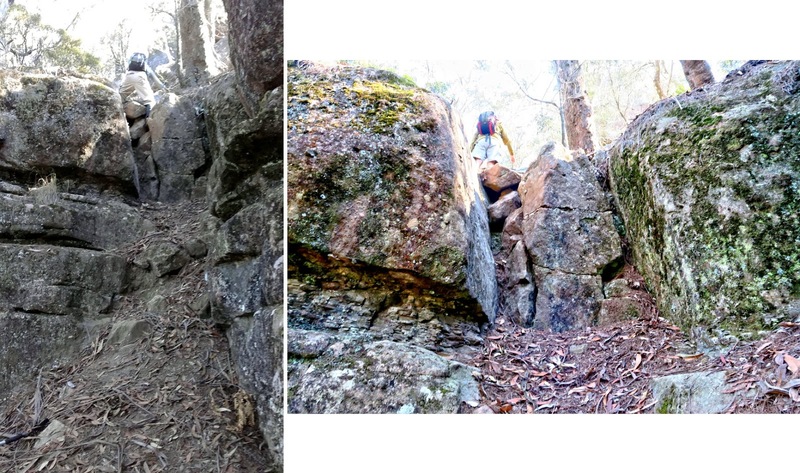 53) After the summit, we climb down the cliffs via the same ramp that we had climbed up (photos #39 and #40). 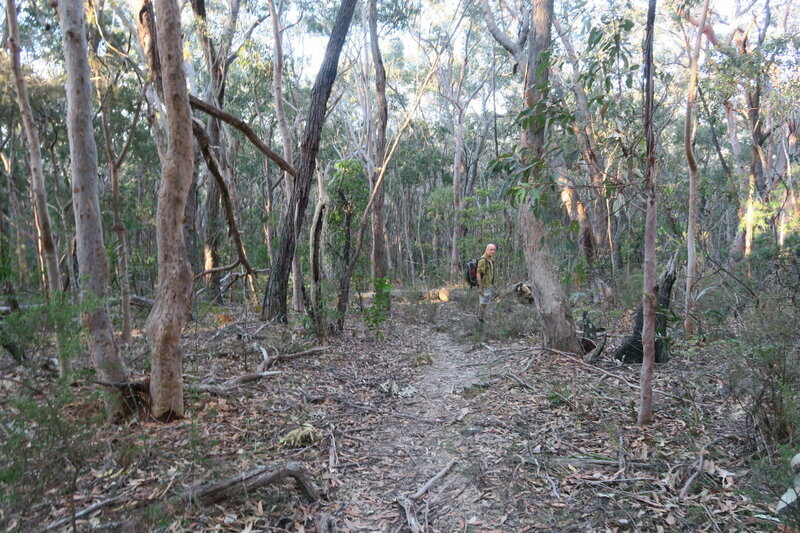 Then we circumnavigate the base of the escarpment surrounding Mt Warrigal in a clockwise direction. 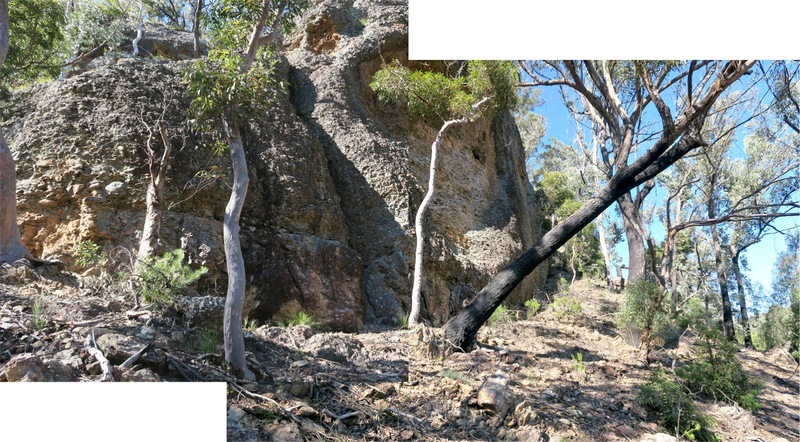 The 2 pics below are the cliffs on the east side of Mt Warrigal when we are heading towards the southern tip of the mountain. 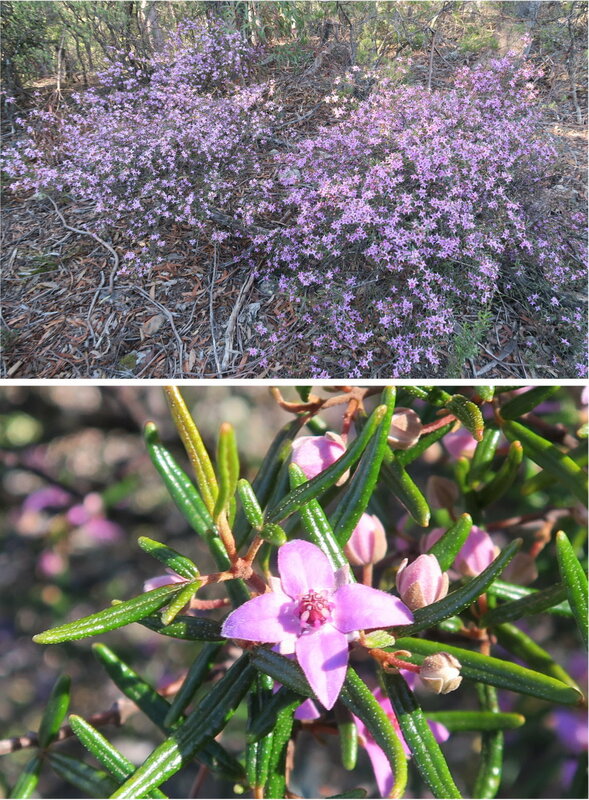 54) Still on the east side of Mt Warrigal, but very close to its southern tip. Here, a big slab has split off and fallen down from the ceiling. We've rounded the southern tip of Mt Warrigal and are now going north along the western side of the its cliffs. 55) This overhang is very close to the southern tip. Someone had built a fireplace. 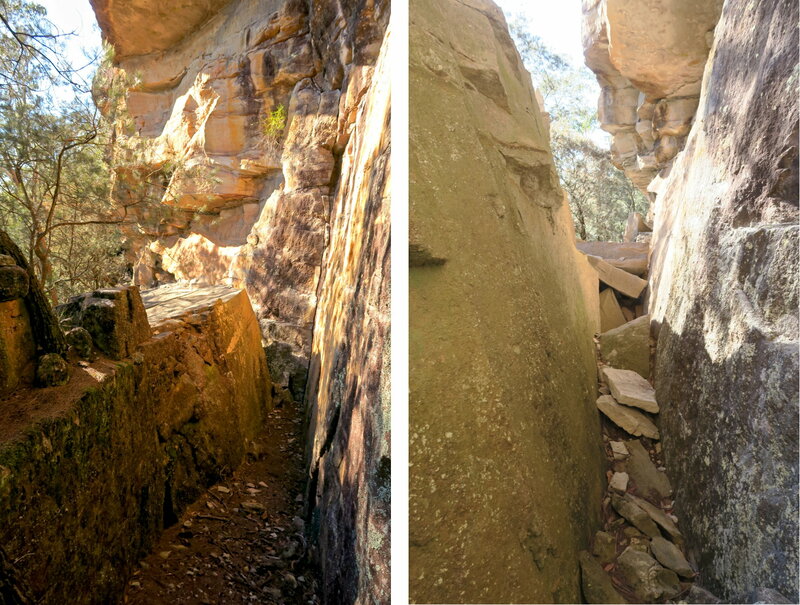 Compare the 2 pics below with the 2 pics in photo #25 in my 2016-02 trip with RZ ( http://mntviews.blogspot.com.au/2016/02/5-wild-dog-mts-blue-mts-nsw-australia.html ), no stone has been touched. It just seems that hardly anyone, and probably no one, has passed through here in the past 6 months. 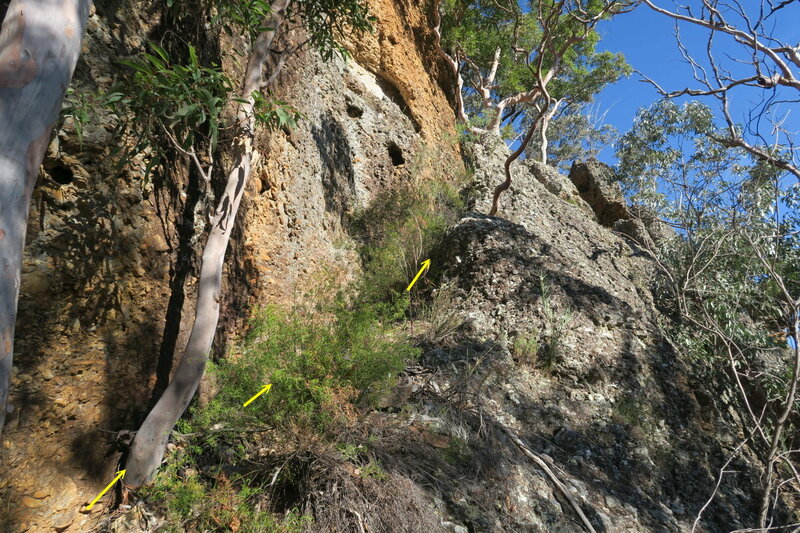 56) These are the cliffs of the western side of Mt Warrigal. A large slab had fallen to create this narrow passage. Left pic: We are walking along the narrow passage. 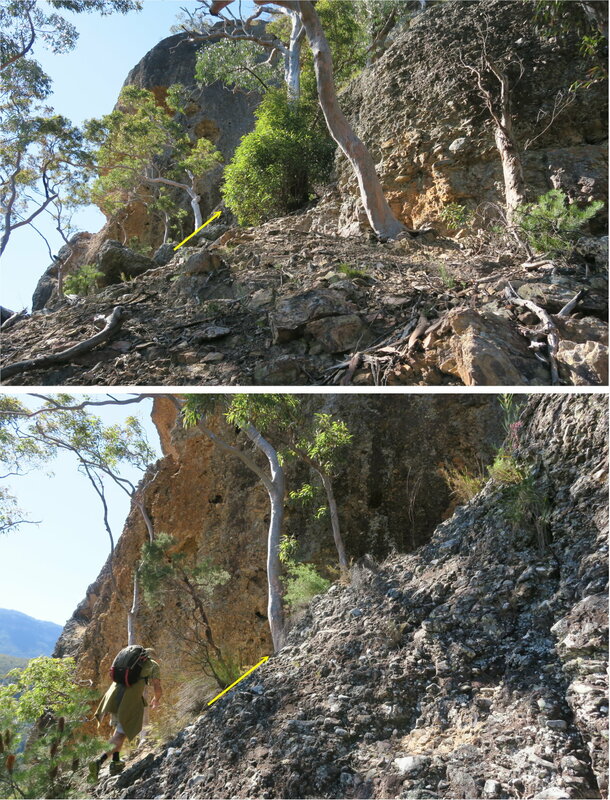 58) ... but NC climbs directly to the top of the fallen slab instead. 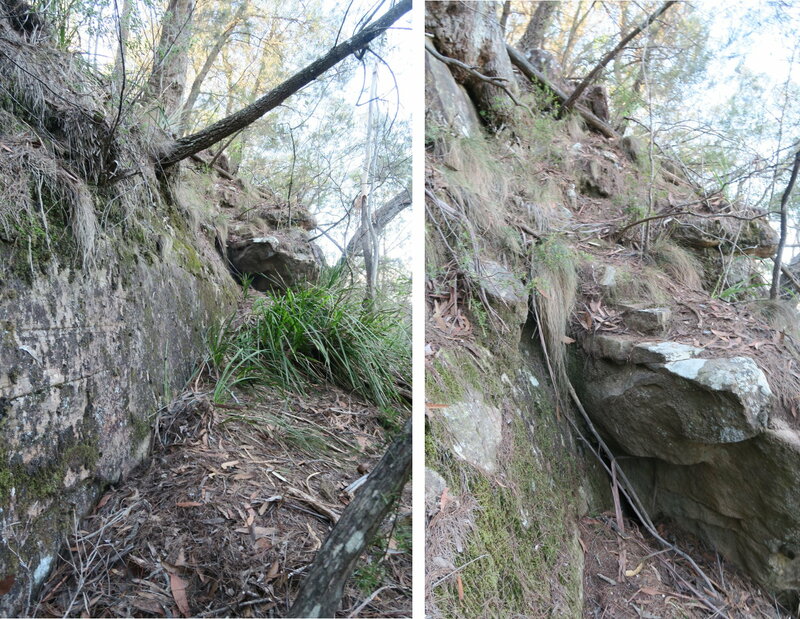 60) After going around the tunnel of the previous pic, and walking further along, we come to this exact same ascent point where Saf and I managed to climb up the cliff 16 months ago in April 2015 ( http://mntviews.blogspot.com.au/2015/04/warrigal-nsw-australia.html ). - The yellow arrow points the way up. - See also photos #30 and #31 of my 2016-02 trip with RZ ( http://mntviews.blogspot.com.au/2016/02/5-wild-dog-mts-blue-mts-nsw-australia.html ) ... The photos there are similar to here; and my body was there to give you a scale of how high you need to climb over. 61) We continue on. 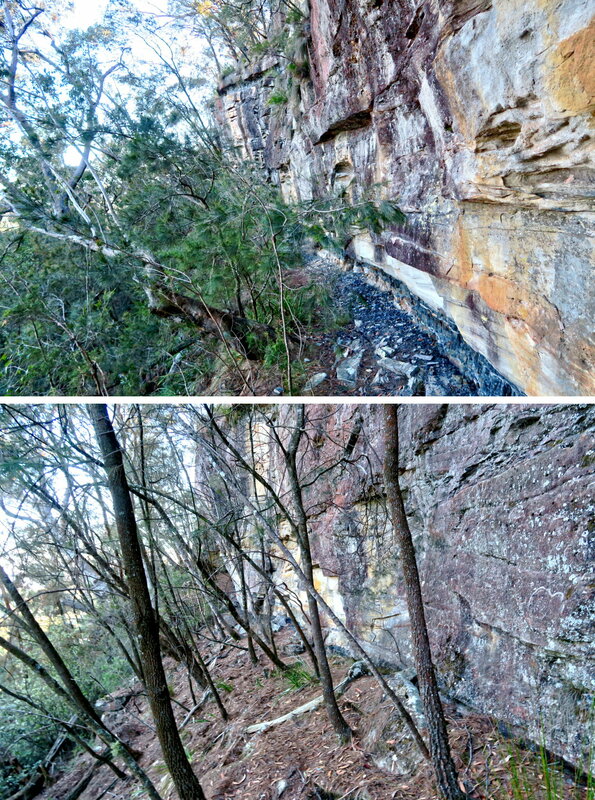 Here are some more photos of the cliffs and overhangs along the western side of Mt Warrigal's escarpment. - Blue Dog Ridge is the 4 horizontal yellow dashes. - Blue Dog Spur is the other 2 yellow dashes. We've rounded the western tip of Mt Warrigal. • Dunphys Camping Area is behind Bellbird Ridge and can't be seen from here. • Lookout on Faithful Hound Ridge ... photo #26. 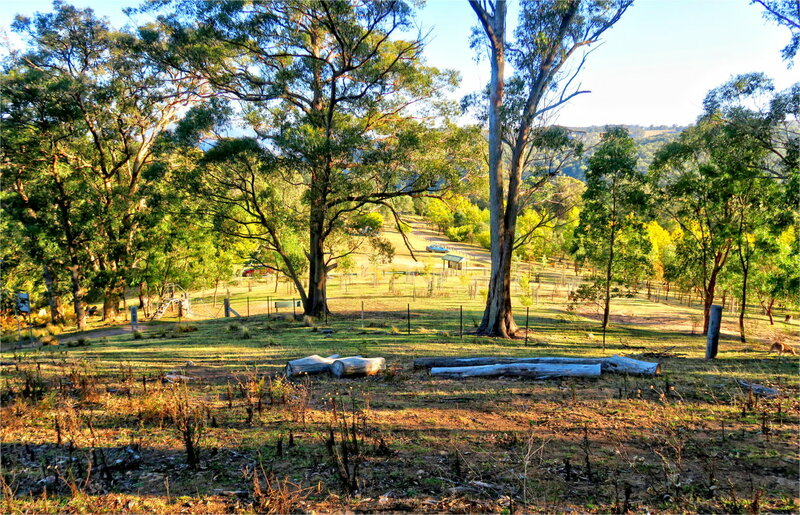 • From Dunphys Camping Area, walk behind Bellbird Ridge. 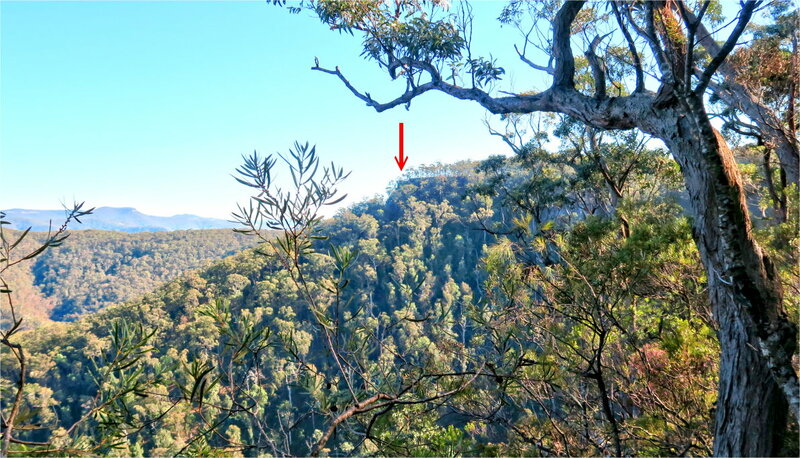 • Then bushbash along the top of Lyrebird Ridge (the 3 yellow arrows pointing towards the left) to Lyrebird Point. • Then bushbash down to Breakfast Creek (the yellow arrow pointing down). 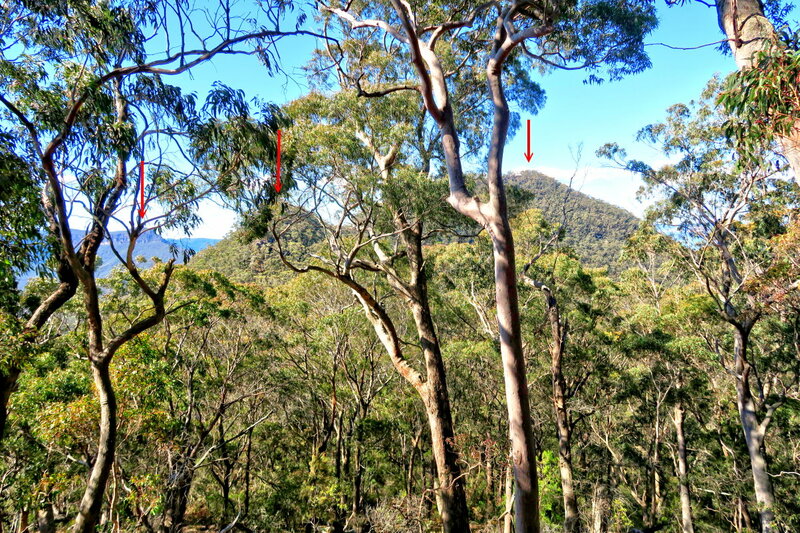 • Then bushbash up to the lookout on Faithful Hound Ridge (the yellow arrow pointing up). • Then keep going along Faithful Hound Ridge, the 2 yellow arrows pointing towards the right. - Black arrows: Medlow Gap Northwest Firetrail, our return route in the late afternoon back to Dunphys Camping Area. 65) We reach the eastern tip ... the same place as where photo #32 was taken. 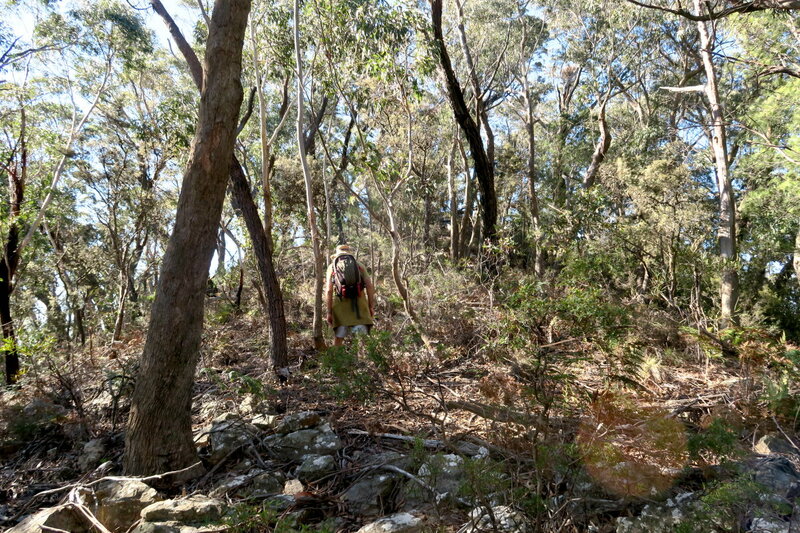 66) We've climbed down Mt Warrigal via Blackhorse Gap. 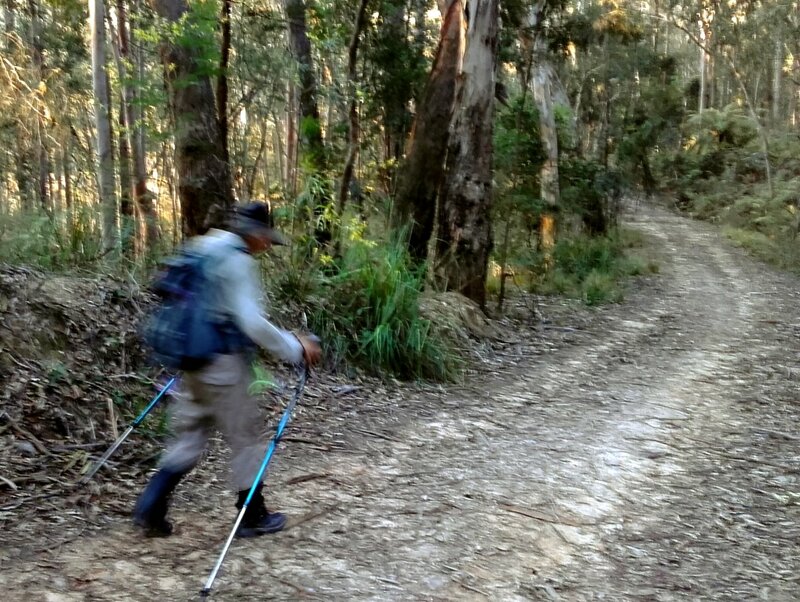 Now on a foot track which skirts around the north side of Mt Mouin to meet up with Medlow Gap Northwest Firetrail. This photo is taken between the tops of Black Horse Ridge and Faithful Hound Ridge. Time now is 5:10pm. It is starting to get dark, as sunset is at 5:30pm, and total darkness is at 6pm. By the time we reach NC's car at Dunphys Camping area, it will be 6:40pm. The final 40 minutes is walking in the dark. The timing is perfect as we get to see Mercury, Venus & Jupiter close together near the horizon ... a rare conjunction, says NC. 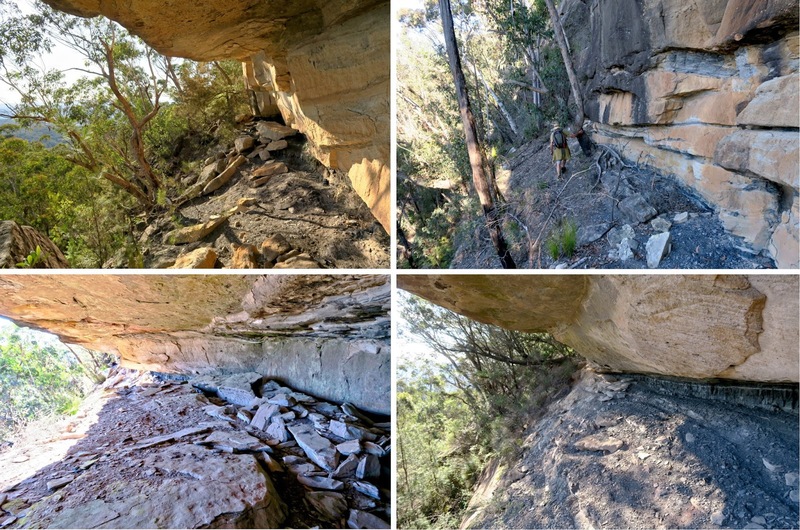 2016-02 Climbed the 5 Wild Dog Mountains of Mouin, Blackhorse, Warrigal, Merrimerrigal & Dingo, via Medlow Gap Northwest Firetrail; return was also via Medlow Gap Northwest Firetrail. 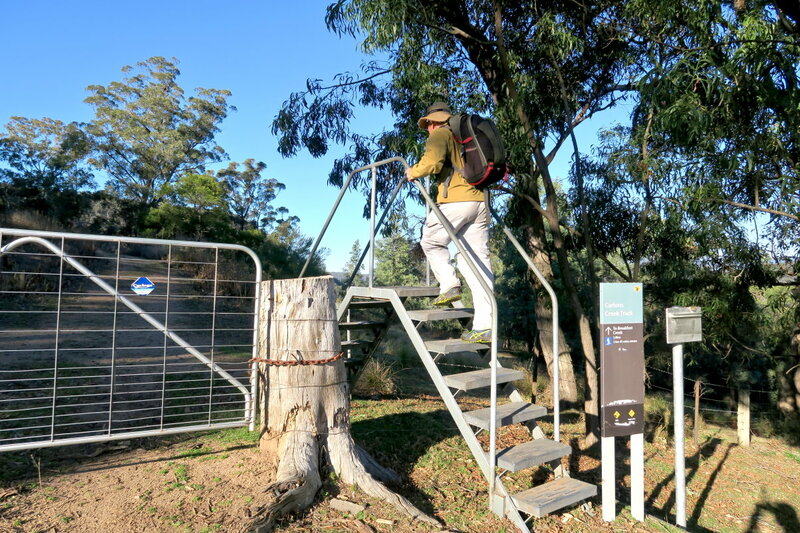 2015-04 Climbed Mt Warrigal via Carlon Creek Track and Black Horse Ridge; return via Medlow Gap Northwest Firetrail. 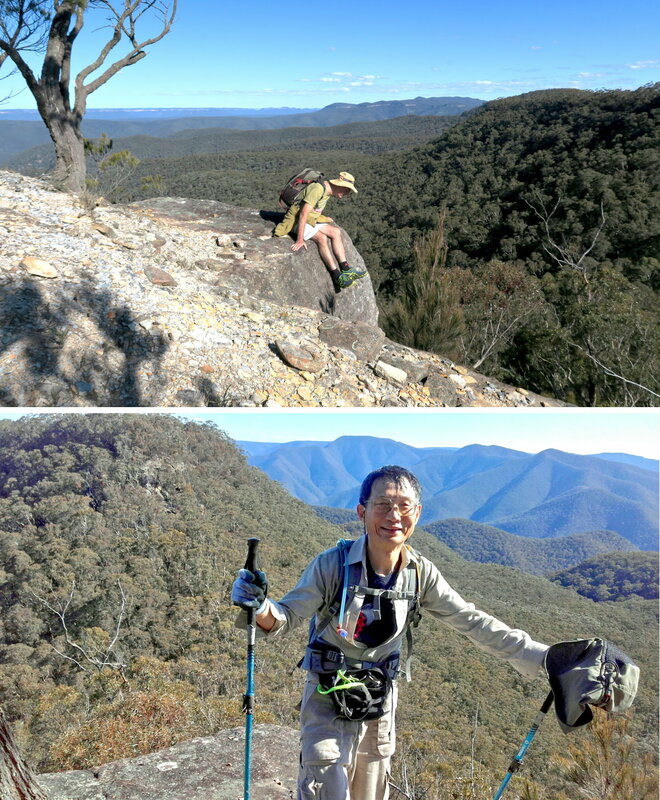 2015-02 Climbed Mt Mouin & Blackhorse Mountain via Bellbird Ridge and Faithful Hound Ridge; return via Cattle Dog Ridge. Thanks for the awesome detail in your blog mate. I'm heading out to Mt Warrigal, Mt Mouin, Mt Dingo and Splendour Rock etc. next weekend for the second time and was looking for a away up onto Mt Warrigal so I hope I can find that ascent point at the southern tip there. Thank you. 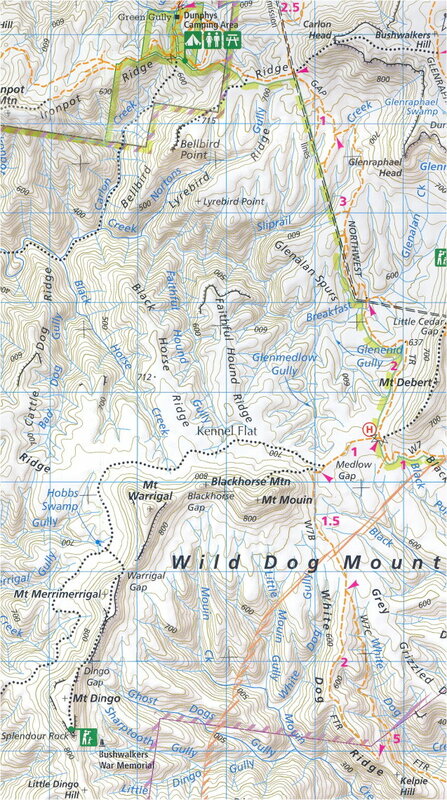 In answer to you question about previous ascent routes on the the western side of Mt Warrigal, Myles Dunphy's Original hand-drawn map of the Gangerang Ranges & Wild Dog Mountains shows an ascent point up on the western side. Having said that it looks to be in that same reference range you've given at the southern tip ??? So you may still have been the first to find the route at the point you did. I'll have to get out there to explore your route one day too when I have more time. Have you been out again to explore that cave on the flank of Black Horse Ridge yet? If your still looking for interested parties let me know. Thanks again Paul, for all your hard work putting together all your track notes and photos! Really appreciate your thoroughness. Can you send over (mntviews@gmail.com) a copy of the original hand-drawn map of the Gangerang Ranges & Wild Dog Mountains showing the ascent point up on the western side? I haven't explore that cave on the flank of Black Horse Ridge yet. Contact me and we can discuss about it. Sorry for the delay in getting back to you. I only by chance saw that you responded to my message the other week, sorry. I'll send you an email now! !